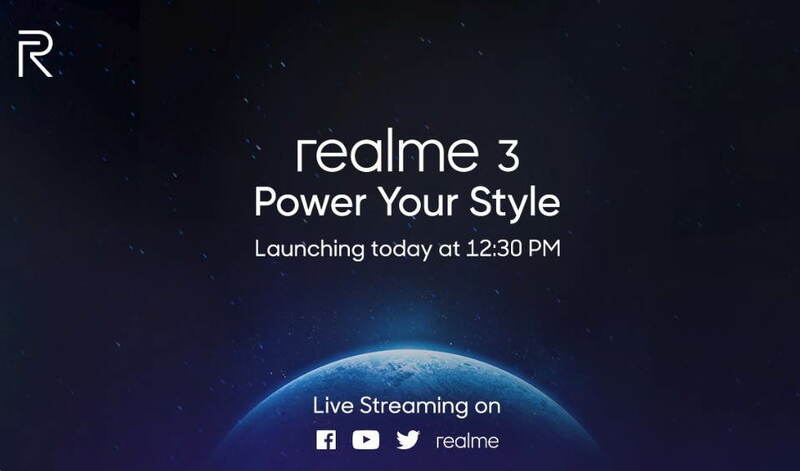 Realme is set to launch its latest smartphone the Realme 3 today in India. The phone is expected to carry a different design and upgraded hardware from its predecessors. The upcoming Realme 3 has already been confirmed that it will have a dual vertically staged camera set up along with a diamond cut designed back. Now, let’s have a quick look at what has been confirmed and expected from today’s Realme 3 India launch, including Price, Specifications, and its availability. It has been already confirmed that Realme 3 will come running on ColorOS 6.0 based Android 9 Pie. To know more about ColorOS 6, you can read our previous post on Top 6 ColorOS 6 Features Coming with the Realme 3. The phone will be powered by MediaTek Helio P70 processor and will feature a dual rear camera setup. However, camera configurations are not yet known. We expect that the Realme 3 could come in 4GB or 6GB RAM option with up to 128GB storage. Realme is also running a quiz on its live stream page. The page lists several questions about upcoming Realme 3 specifications to guess including Camera, Screen size, Quality of the Realme 3, Processor, Battery and more. The page hints that the Realme 3 could feature a 6.22” Dewdrop Screen. For the camera configurations, the list includes 8MP, 10MP, 12MP, 13MP cameras to guess from. Since Realm 3 has been confirmed to sport a dual rear camera setup, we expect it to include an 8MP+13MP dual rear camera setup. For its quality, we expect the Realme 3 to be a budget smartphone with good build quality. The page also asks about the first Realme 3 sale in India, and we expect it to be starting from March 11 to March 12. It’s worth mentioning here that, in a telephonic interaction, CEO Madhav Sheth told Indian Express that Realme is aiming to launch its next device in the second half of 2019. Sheth also revealed that the company is also working to launch another smartphone with a 48-megapixel camera, but we don’t have any further details on that. We also expect that the phone will surely be available in Radiant Blue color option and will include a 4230mAh powerful battery. There are no details on its pricing as yet. The Realme 3 will be available exclusively on Flipkart. The Realme 3 launch is set for today on March 4, at Nehru Planetarium, New Delhi India. As per the official post, every Realme 3 launch attendee today will get gift’s worth ₹2k+.